Yes, I'd like to attend the 2014 NUESTRO FUTURO Conference at 9 AM-2 pm Thursday, November 20 at the Capital Hilton in Washington, DC. Please fill out all fields and click submit. How can I register? 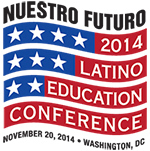 Please fill out the registration form at left to attend the 2014 NUESTRO FUTURO Conference at 8 AM-2 pm on November 20, 2014 at the Capital Hilton. This confirms your participation and we will be in touch with you closer to the event regarding the agenda and other details. Can I bring a guest? We encourage you to invite any guests or colleagues from your organization, but please have them fill out separate registration forms. What is the cost? Attendance at the 2014 NUESTRO FUTURO Conference is free. Out-of-town invitees are responsible for all travel arrangements and accomodations. What is the deadline for registration? As attendance is complimentary and space is limited, please return this form to reserve your place at your earliest convenience. Where will the conference be held? It will be held at the Capital Hilton, 1001 16th St. NW, Washington, DC 20036. For out-of-town participants, please book accomodations as soon as possible (see below). How do I make travel arrangements? For travel arrangements and hotel reservations, please call Ada Pena of ADA Travel at 1-800-ADA-5199.